Protest outside Target in Washington, DC. Photo by United Students Against Sweatshops. North Carolina has suffered tens of thousands of job losses to foreign competition. Once those jobs leave our shores, they don’t always stay in one place for long, as multinational corporations close shops and open new ones in a race to the bottom for labor. It’s an unfortunate but familiar story for textile workers. The company sets up shop, working conditions and pay are poor, workers unionize for a better life, and the company closes the plant in search of cheaper, more exploitable labor elsewhere. This time, however, that story has a different ending. When Atlanta-based sports apparel maker Russell Athletic lost a two year campaign to defeat the effort to form a union of 1,200 of its textile workers in Honduras, the company fired them all and closed the plant. 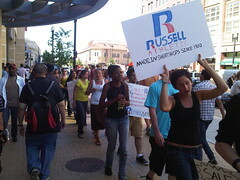 From the time Russell shut the factory last January, the anti-sweatshop coalition orchestrated a nationwide campaign against the company. Most important, the coalition, United Students Against Sweatshops, persuaded the administrations of Boston College, Columbia, Harvard, New York University, Stanford, Michigan, North Carolina and 89 other colleges and universities to sever or suspend their licensing agreements with Russell. The agreements — some yielding more than $1 million in sales — allowed Russell to put university logos on T-shirts, sweatshirts and fleeces. Not only does the agreement between Russell Athletic and the union, the General Confederation of Workers, reopen the factory and rehire all the fired workers, the company has agreed to neutrality at its other plants in Honduras, including those of its parent company, Fruit of the Loom. Read the details here.